A cool start to our Sunday after the passage of a cold front. High pressure in control today will allow for ample sunshine, less wind and temperatures reaching the mid 50s. 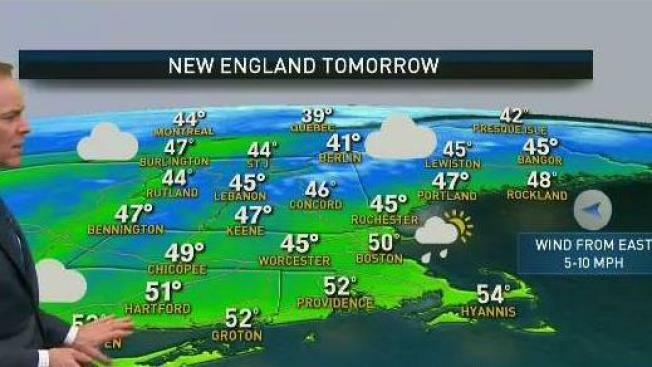 Perfect weather for tailgating at Gillette, but by game time it will be chilly. Dress for the 30s since the stadium is rural. Clouds increase to start the week and rain chances return by midday Monday along the south eastern part of the region and arriving to Boston by the evening commute. Expect highs in the upper 40s and lows in the mid 40s, so not much variance in temperature.